The minor miracle of My Cousin Vinny is that—though the picture never scores any guffaws, the villains remain off-screen, and the conclusion is never in doubt—the movie's full two-hour running time passes so breezily. 120 min. 20th Century Fox Distribution. Director: Jonathan Lynn. Cast: Joe Pesci, Ralph Macchio, Marisa Tomei, Mitchell Whitfield, Fred Gwynne. "He's not your typical hero." So said the trailer for My Cousin Vinny, in which Joe Pesci makes a hero of a mook. New York lawyer Vinny Gambini is one vowel away from sounding like the member of a crime family, but he's not the type of lowlife Pesci often plays in Martin Scorsese movies. Rather, he's a guy who wants to do right by his wrongly accused cousin and, in the process, earn pride in himself as a professional. The surprises pretty much end there in My Cousin Vinny, written by Dale Launer (Ruthless People, Dirty Rotten Scoundrels) and directed by Jonathan Lynn (Clue). The setup is boilerplate "fish out of water" stuff: New York buddies Bill Gambini (Ralph Macchio) and Stan Rothenstein (Mitchell Whitfield) are driving through Alabama on their way to college when a convenience store stop lays the groundwork for a Kafkaesque nightmare. A little ways down the road, they're arrested for the murder of the clerk, though he was alive and well when the boys left him. Bill arranges for his cousin Vinny to come out and defend the boys, though it turns out that the personal injury attorney has never even set foot into a courtroom, not even to observe. What's worse, he apparently has never watched so much as an episode of Perry Mason. From the get-go, Vinny gets on the bad side of Judge Haller (Fred Gwynne of The Munsters fame) by wearing a leather jacket, foregoing a tie, and staying seated when the judge enters. Vinny has the moral support of the woman who accompanied him to Alabama, his fiancée Mona Lisa Vito (Marisa Tomei). In a much second-guessed Oscar win, Tomei took home the Best Supporting Actress award for her work here, which is sharp but hardly dazzling (later roles would illuminate her range, in pictures like Before the Devil Knows You're Dead and The Wrestler). Lisa wants the kind of partnership—and marriage—where her opinion matters and her participation counts, and indeed one suspects she'd make a better lawyer than Vinny (she realizes before he does that he's owed "discovery" in the case). If Lisa makes things easier for Vinny, small-town Alabama makes them hard: every motel he tries suffers from sound pollution, making a night in jail for contempt of court an attractive alternative. One of the film's strengths is its resistance to loud stereotypes and its fair play with the supporting characters, from Gwynne's understandably stern judge to Lane Smith as the gentlemanly D.A., and Austin Pendleton as the public defender the boys consider when things look their bleakest. We're in good hands with these actors, and the minor miracle of My Cousin Vinny is that—though the picture never scores any guffaws, the villains remain off-screen, and the conclusion is never in doubt—the movie's full two-hour running time passes so breezily. 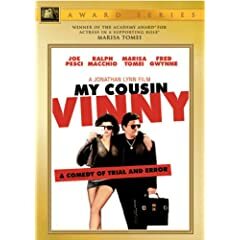 My Cousin Vinny makes its Blu-ray debut in a solid transfer that, while a bit on the dull side, accurately represents the film's theatrical look with detail, contrast, and depth that mark a significant upgrade from DVD. This won't be your reference disc, but it gives a nice treatment to an aging catalog title. The DTS-HD Master Audio 5.1 and Dolby Digital 2.0 audio options likewise won't set the world on fire, but they maximize the source materials and offer an aural presentation for this movie that can be considered definitive. Bonus features don't reach far beyond a commentary by director Jonathan Lynn, but the track offers plenty of interesting anecdotal detail about the movie and gives a good sense of Lynn's character as a director. Also on hand" the movie's "Trailer A" (1:55, SD), "Trailer B" (1:24, SD), and the TV Spots "Up to His Ears" (:30, SD) and "Lover" (:30, SD). All site content © 2000-2019 Peter Canavese. Page generated at 04/24/2019 07:28:56AM.